Originally posted in New American Journal on June 4th. Opposites appear at opposite ends of Alabama on June 5. At the upper extreme a rally in Florence is calling for tar sands mining to stop before it begins. Geologists have long known that gummy crude oil is locked into sandstone strata underlying north Alabama and Mississippi. Lately techniques for extracting it have improved and easy reservoirs of standard oil have dwindled. Last summer governors Robert Bentley of Alabama and Phil Bryant of Mississippi met to announce plans for mining these deposits. They said their states might contain 7.5 billion barrels of oil trapped in the sandstone, and they want it to be released, sold and burned. They assured doubters that the methods used would be guided by the “best practices” observed in Canadian tar sands operations. This assurance was so alarming that resistance arose in north Alabama. Tar sands mines in Canada’s Alberta province have left large parts of it looking like a moonscape, stripped bare, gouged, and littered with wastes. Image: Alberta, Canada tar sands mine. Preliminary poking around north Alabama by oil companies, plus dreams of fast and easy money for landowners by selling mineral rights, have shown that this project is not just a memo issued by the governors. It is already a fertilized and growing embryo, and the organizers of the rally are not happy about it. The rally will be at Wilson Park in Florence from 4 – 8 p.m. For details about it and about the issues involved see the Facebook page: Stop Alabama Tar Sands Mining. At the lower extreme of the state the energy industry is staging a forum to which the public is invited — as spectators, not participants. Sponsors of this Gulf Coast Energy Forum are the Consumer Energy Alliance and the Partnership for Affordable Clean Energy, organizations whose members are mostly other organizations, and most of those are energy companies. The proper term for these industry fronts masquerading as grassroots groups is AstroTurf groups. The roster of speakers reflects this synthetic character. Most of them are energy executives, along with some allied politicians and bureaucrats. None of them are citizens who have made themselves informed advocates about these issues. During the past few years one after another after another project has popped into view that would sharply change the way lives are lived in the area. They involve pipelines, and railroads, and tank farms, and coal terminals, and ships, and more. When the public becomes aware of these schemes the planning has long been underway and the construction may even have begun. Then any citizens’ questions and complaints lag behind ongoing events and struggle to catch up. But in the process of attempting to understand who is doing what and why, these ordinary people become highly educated about the issues. And paired with this self-instruction is a stake in the local outcome of these matters that no distant CEO can fully appreciate, no matter how expert he may be in the technology and economics of energy. Any alleged public forum that makes no place on the program for such informed, involved voices is not really/actually a public event. It is a ceremony where those few with the institutional authority to decree the fate of the many assemble to announce what they have decided to do to the mute others. So the others are attending anyway. Some will be picketing outside the highrise waterfront hotel housing the energy forum. And some will be coming inside to insert their uninvited views into the proceedings. Many of these folks will be from the north Mobile Africatown area, which is across the street from a proposed tank farm so immense it should be called a tank city. A design submitted to the Mobile planning commission shows 37 tanks, each 64 feet tall and ranging from 80 to 100 feet in diameter. Picture a tank the height of a six story building almost filling the infield of a baseball diamond. Multiply this vision by 37. That’s tank city. 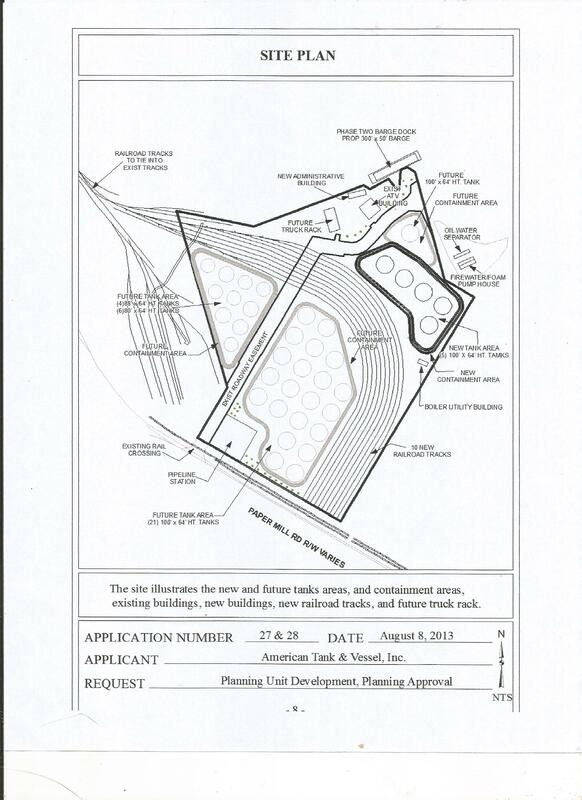 Image: Africatown "Tank City" plan. View full size here. Then add ten railroad tracks arching through the expanse of tanks. And remember the 7.5 billion barrels of tar sands underground in north Alabama and Mississippi. And remember the Canadian tar sands already arriving by tanker train in Mobile. And the new pipeline through the city’s reservoir watershed en route to the big refinery on the Mississippi coast. And the new pipeline through Africatown, plus a proposed pipeline under the river downtown, connecting existing tank farms to expanding ones. And the expanding coal export dock. And the bigger tanker and coal ships heading to the port as the Panama canal enlarges. All the signs are that a gusher of fossil fuels is coming to Mobile, seeking an outlet to the ocean. The most likely purpose of the energy forum is to prepare the city to accept this. For those locals sniffing a quick personal bonanza, the persuasion will be easy. A few jobs will come, but the big money will be in contracts for construction and transport companies and in fees for services like engineering, law and finance. For everybody else the prospects are dim and grim. A residential area like Africatown with an ugly, stinky and explosive tank city looming beside it is marked for extinction. A city that allows its hurricane-flood-zone waterfront to be lined with crude oil and petrochemical tank farms holding the volume of the Exxon Valdez many times over is a city turning itself and its bay into a target for disaster. And a society that welcomes a fossil fuel expansion as it becomes harder and harder to deny the damage done by burning this stuff is a society scratching a suicidal itch. In these circumstances the voices excluded from the energy forum are the ones most needed. The voices given the platform and the microphone are the ones that will repeat and magnify the mistakes already made. In other eras, when humans had less capacity to injure themselves, disagreements about approach and policy could certainly cause frictions — sometimes deadly ones. But mistakes were rarely final errors. Time and wisdom could correct false courses. But technical prowess has now made mass destruction easy. Those who wield this capacity recklessly are no longer indulging in a difference of opinion about how to proceed. They are becoming a menace to the rest of us and to creation.